I created this coconut cashew soup on a very wet and rainy day. I wanted something warming, full of seasonal vegetables, packed with flavour and a good amount of plant-based protein. This style of soup is so quick and easy to prepare, I’ll often whip up a batch for lunch and it will last us for the rest of the week. I start with a broth or stock base, add flavourings and spices, followed by whatever fresh vegetables I have to hand, and some form of protein. To finish I’ll stir through some coconut milk and make any last flavour adjustments. 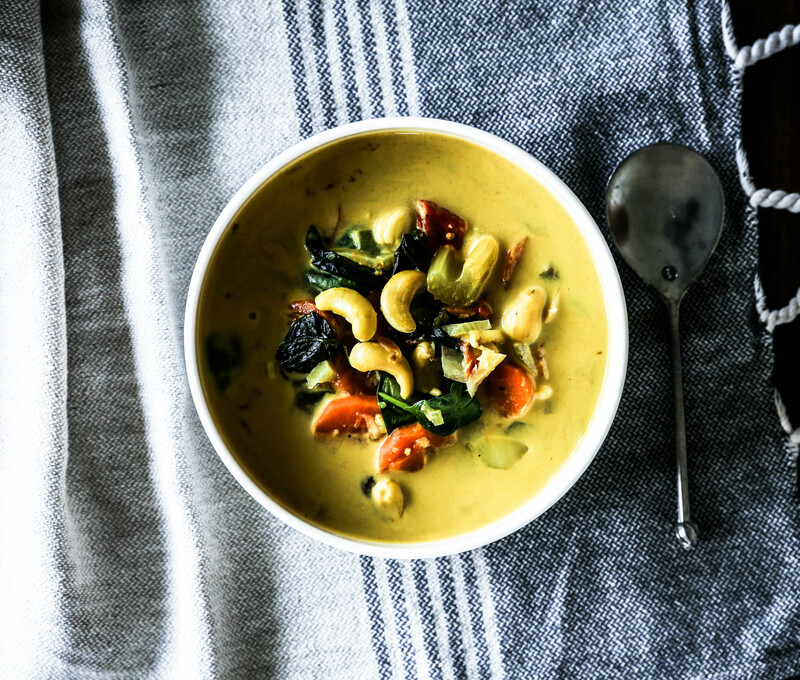 On this particular day I tried activated cashew nuts as the main protein and the resulting soup was so delicious it was worthy of it’s own blog post! I love using fresh ginger and turmeric together as aside from tasting amazing, they both have brilliant anti-inflammatory properties that are good for your body on so many levels. I soaked the cashews in this recipe before adding them to the soup as his removes the inhibitor enzymes on their skins making them much more easy to digest. It also gives the cashew nuts a lovely soft texture which goes perfectly with the other vegetables in the soup. This soup is so versatile and can be adapted to whatever fresh seasonal produce you have to hand. If you don’t have tomatoes, simply leave them out. Likewise if you have pumpkin or sweet potato instead of carrots, then use them instead. A good rule of thumb is to add any hard vegetables to the broth first to give them the longest cooking time, and add the soft vegetables such as spinach or other leafy greens last as they don’t need nearly as much cooking time and are much nicer when they retain their green colour. This soup is naturally dairy, gluten and sugar free yet it has a lovely rich, creamy, almost sweet flavour from the coconut milk and fresh turmeric. If you want to up the protein content further you could add some lentils, chicpeas or even some finely sliced chicken. This soup keeps well in the fridge for up to a week and makes a wonderful warming lunch or dinner. Enjoy! Are you a soup fan? Any questions or comments about the recipe? Leave me a message down below – I love to hear from you! Start by soaking (aka activating) the cashews by placing them in a bowl and covering with filtered water. Leave to stand for 2-4 hours. This step is optional especially if you are short on time, as the soup will still taste just as good without soaking the cashews. The benefit of soaking the cashews is that it removes the inhibitor enzymes from their skins making them much more easy to digest and gives them a nice soft texture. To make the soup, place the broth, water, onion, garlic, ginger, turmeric and cinnamon into a large pot set over medium heat. While the soup base is heating up prepare the rest of the vegetables. Peel and chop the carrots and celery into bite size pieces and add to the soup. Wash the spinach leaves well, wash and chop the tomatoes and add to the soup once it has come up to a simmer. Add salt and pepper to taste. When the carrot is cooked (which can be tested by cutting a piece with a butter knife and it should slide easily through), turn off the heat and add the coconut milk. Stir well to combine. Lastly rinse the soaked cashew nuts well and add to the soup. Serve the soup warm with your favourite crusty bread or raw seed crackers. 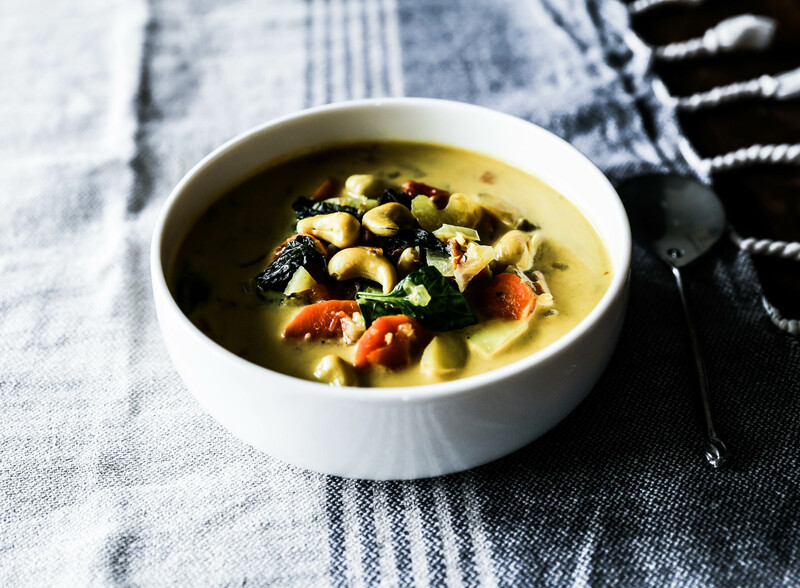 This coconut cashew soup with cashew nuts will keep well in a sealed container in the fridge for approximately a week, and will freeze for up to 3 months. Enjoy. Came out great, thanks for the recipe.